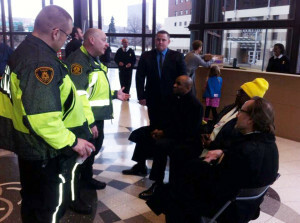 UPMC Worker Christoria Hughes, Rev. Rodney Lyde, and Rev. Dr. Ronald Wanless were arrested at UPMC headquarters this afternoon while calling on UPMC to pay all of its employees a living wage. This afternoon, UPMC executives showed their disregard for the plight of employees who keep the healthcare system running smoothly every day. I was part of a delegation of faith leaders and workers asking to meet with decision-makers, to secure UPMC’s commitment to lifting workers out of poverty. We didn’t have that meeting. Instead, we were arrested. It’s time for management to respond to the needs of its workers. 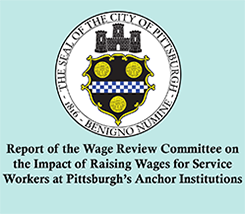 Please join us tomorrow to amplify our call for living wages at 8 am at the US Steel Tower. I was arrested with Christoria Hughes, a proud mother and grandmother who has worked at UPMC for six years. When Christoria moved to Pittsburgh, she hoped a job with the city’s largest employer would mean economic security for her family. But even with full time hours, she only brings home about $350 a week and relies on public subsidies and food banks to make ends meet. I accompanied Christoria into the UPMC headquarters today because her concerns and those of her coworkers have gone unanswered. UPMC workers’ efforts to come together to make change have been met with harassment and retaliation now being prosecuted by the federal Labor Board. Pay every health care worker no less than $15.00 an hour. Workers who work full-time need family-sustaining jobs that don’t require public assistance, and our community needs a strong and healthy middle class. Erase the medical debt of UPMC employees. People who work for the region’s largest health care provider should not struggle with medical bills. Allow workers to form their union without interference. Respect all UPMC employees’ right to organize for a voice at work by ensuring a fair process to form a union free of management harassment, intimidation and attempts to influence workers’ choice. I believe that UPMC should meet employees who wish to rise with open arms and in a spirit of collaboration. I’m proud to stand with Christoria and with all of the UPMC workers who are standing strong in this fight for better wages for their families and for a healthier, stronger city for all of us. 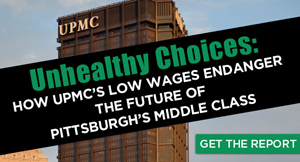 It is time to shift UPMC’s priorities from corporate jests and executive compensation to the needs of working families. Join us on Friday at 8 am at the US Steel Tower to tell executives that Pittsburgh is ready for change. Right now, sign this petition to show your support – and send it to your friends. I’ll be with you on Monday.